From left: Senior Aaron Ostrander and Junior Michael Carpenter, ASM Club president, pose during the Lawn Mower Clinic's drop-off on March 10.
ith spring showers comes April flowers and a lively lawn, thus reminding the Columbia community to bring its lawn mowers out of their winter hibernation. Collecting money for a good cause, the Agricultural Systems Management Club will tune up lawn mowers at its annual Lawn Mower Clinic. From left: Junior Michael Carpenter, ASM Club president, and Senior Aaron Ostrander wait for … Expand ▸From left: Junior Michael Carpenter, ASM Club president, and Senior Aaron Ostrander wait for customers at the sign in desk at the Lawn Mower Clinic’s first drop-off day. For the last 35 years, the Lawn Mower Clinic has provided Columbia and surrounding communities with affordable lawn mower maintenance. For $30 club members will change the spark plug, sharpen the mower blade, clean the air filter, change the oil and power wash the lawn mower. ASM Club President Michael Carpenter said club members are enthusiastic about working the clinic because it allows them to build relationships. The Lawn Mower Clinic is held twice every spring. The first clinic of the year was March 10-15. The next clinic will be April 7-12. Drop off and pick up will be at the Agricultural Engineering Building at the garage entrance located along East Campus Drive. April 7-8: Drop off from 7 a.m. to 9 a.m., 4 p.m. to 6 p.m.
April 11-12: Pick up from 7 a.m. to 9 a.m., 4 p.m. to 6 p.m. The first lawn mower clinic fundraiser of the year attracted 103 customers. On Saturday, Mar. 12, a team of approximately 20 club members created an assembly line where they fine-tuned the lawn mowers. Over the years the club has created a system. 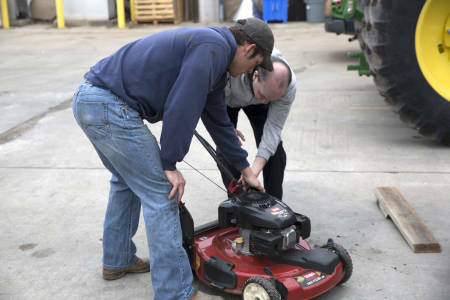 To avoid confusion, club leaders give quick training sessions about how to correctly handle mowers and label them as volunteers complete tasks. 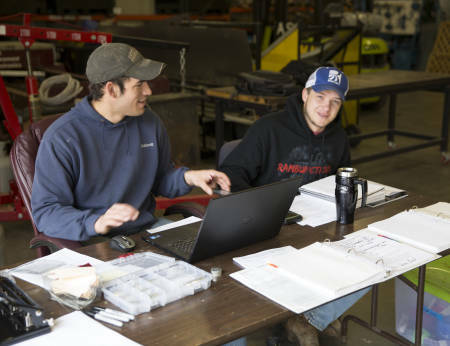 “It becomes a real learning experience for some of the students,” said Professor Leon Schumacher, agricultural systems management program chair and ASM Club faculty advisor. Funds raised by the clinic go toward club expenses for meetings and trips and donations to scholarships and other student organizations. ASM Club President Michael Carpenter helps a customer unload his lawn mower from his car. The ASM Club invites agriculture business leaders from companies like Cargill, ADM or Bartlett to its monthly meetings. These events serve as a networking opportunity for club members where they not only get to know one another, but get to learn about these leaders, many of which are alums, on a more personal level. These guests usually share life tips and how they climbed the job ladder. The ASM Club will use part of the money earned from the clinic to provide meals at these monthly meetings. The meals motivate club members to attend and create a more social atmosphere. The club also uses some funds for club trips. Recently the club went to the Quad Cities, a region along the border of Illinois and Iowa near Moline, Illinois. The club toured John Deere’s combine and planter facilities. From there, the club traveled to Kinze’s grain cart facility in Williamsburg, Iowa. Some of the proceeds will go to fund the Sandy Zaring Perseverance Award. Sandy (Beasley) Zaring was an administrative assistant with the Agricultural Systems Management program for more than 14 years and helped the ASM Club with planning meals for monthly meetings, among other things. When Zaring lost her battle with cancer in 2015, ASM wanted to do something to carry on her memory. 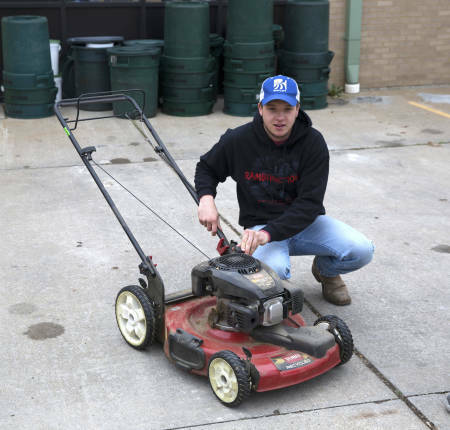 Senior Aaron Ostrander checks gas in a lawn mower during drop-off. Some of the money earned from the clinic will go to the Quarter Scale Tractor Team. Students build the tractors used for practice and competitions, and each tractor is about a $12,000 investment, according to Schumacher. Volunteers at the clinic dedicate time out of their busy schedules to participate in the fundraiser. Schumacher not only supervises the event but also helps work on the lawn mowers with students.